In our previous Daily note on Friday, we had mentioned about the importance of the NIFTY moving past the 10275-10300 zones to confirm a temporary base. The Markets remained tentative all though the Friday’s session and the benchmark Index NIFTY50 struggled to move past the 10275-10300 zones and saw retracement once it tested those levels. It ended the day with a modest loss of 15.80 points or 0.15%. While we enter a fresh week, Monday’s trade is likely to see a stable and strong opening ensured by strong global markets. Having said that, the likely strong opening will see the Markets opening above 10275-10300 zone. However, it would be once again critical to see if the Markets sustains and maintains itself above those levels. In all likelihood, we will see Markets defending those levels. Monday will see the levels of 10300 and 10365 posing as immediate resistance area for the Markets. Supports come in at 10210 and 10140 area. The Relative Strength Index – RSI on the Daily Chart is 36.4385 and it stays neutral against the price showing no divergence. It is seen taking a pattern support as well. Daily MACD stays bearish while trading below its signal line. No significant formations were observed on Candles. 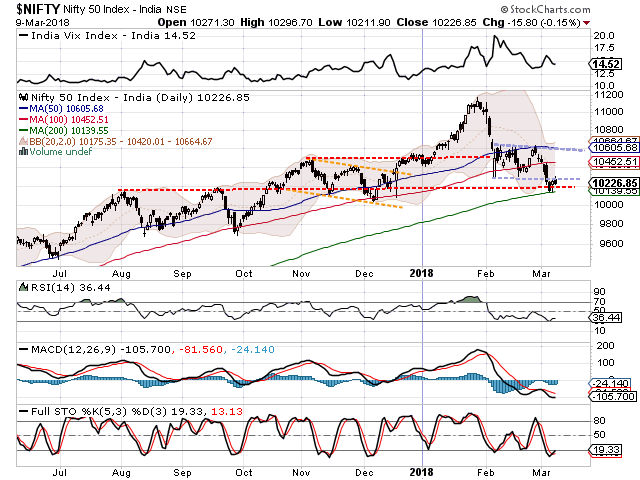 Pattern analysis highlights the credibility of the support that is provided by 200-DMA. NIFTY tested this level twice during last week and each time it did so, it has defended it as well. In the immediate short term, we believe this level will stay defended and will not see NIFTY breaching this level in the immediate short term. Overall, as mentioned, despite a stable and strong opening which is likely on Monday, sustenance above those levels and capitalizing on such possibly strong opening will remain key thing to watch for. Moving past 10275-10300 zones will see the Markets back into the rectangle trading channel that it has formed after the recent corrective decline. If this happens, we see Markets advancing towards its next logical resistance of 100-DMA which stands at 10452. Though cautious, but positive outlook is advised for the day.